Too many children in America can’t read this. Help us change that. Literacy at an early age is a fundamental component to education. Without the ability to read and read well, children become enslaved to a lifetime of low information learning, resulting in low income, and the inability to be an effective steward of their world. 1. Literacy focused programs. Each summer Rise Raptor Project conducts a tour of all Madison County, AL library branches in support of their summer reading program. 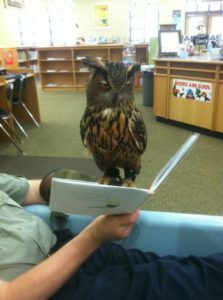 Emphasis is placed on how reading can open up an entire natural world and take them places they may never see in person. Books on raptors fly from the shelves and are checked out for summer reading. 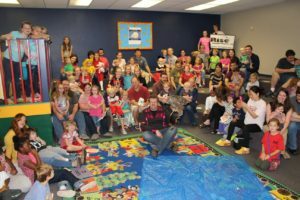 These programs are always a favorite among low income children who through the public library systems efforts have the opportunity to see and learn about these fantastic birds and be encouraged to learn more about them and the world they share with us through reading. 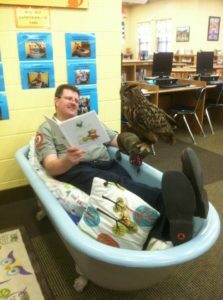 During the school year, Maximus our Eurasian Eagle Owl is often found “reading” to the students at Goldsmith Schiffman Elementary in support of their “Owlsome Readers” program. What is the book about you wonder? Well, owls of course. 2. Own very own children’s book. Have you wondered who puts life into Batman, Deadpool, Wonder Woman, Superman, or X-Men? One of those people is Nathan Massengill of Super Powered Studios at Lowe Mill Arts Center, Huntsville, AL. Nathan is famous for illustrating comics and graphic novels for Stan Lee, DC, MARVEL, and other projects. Super Powered Studios and Rise Raptor Project have teamed to introduce a new super hero to the world, Maximus, The Guardian of Strixland in a new graphic novel written by Curt Cearley. Maximus teaches students valuable lessons on the importance of reading and lifelong learning, and honors the real world super heroes of our society, teachers. The story unfolds as students become lost in the great forest. Elation, deception, danger, and plot twists emerge as a variety of new hero characters arrive to teach much needed lessons. At every step there are hidden symbolic meanings, which are explained in the second half of the book. Topics include: the science of flight, birds of prey, endangered species, the foundation of America, and Native American History. To aid in funding the book, Super Powered Studios and Rise are releasing beautiful artwork pieces personally signed by Nathan based on the book’s characters. This book will support the education and conservation mission of Rise Raptor Project. All proceeds from the sale of this art will help fund further book development. Help support literacy now and get this awesome 11 x 17″ owl artwork signed by Nathan Massengill of Maximus Gaurdian of Strixland!